For some reason this week I’ve been seriously craving yoga. My workout preferences definitely vary with my mood and I’ve just really been into the calming effect of being on my yoga mat and getting lost in my practice recently. 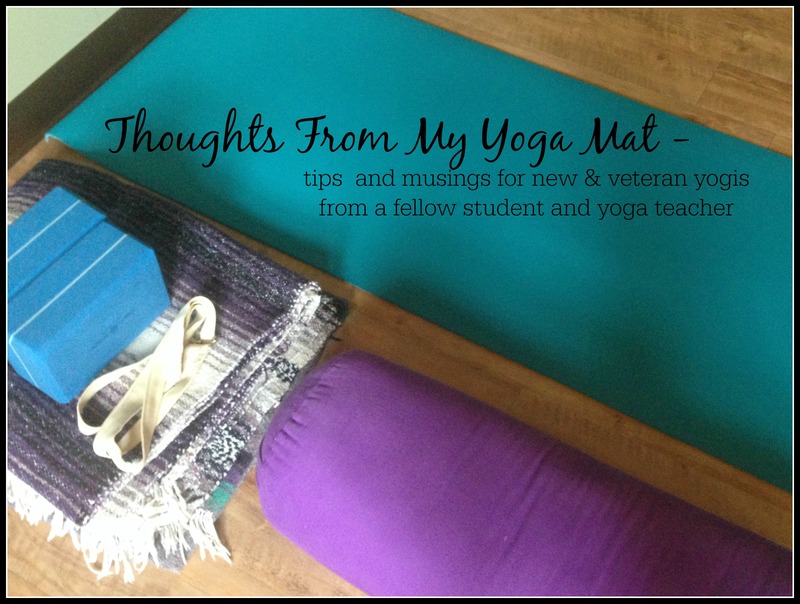 I know I typically talk a lot of running around here, but since I’ve been spending so much time at the yoga studio this week (both teaching and taking classes), I wanted to share some thoughts & observations that may be useful to both new and veteran yogis! If you arrive late enter quietly! Again, it amazes me that I feel that this needs to be pointed out, but in the class I went to last night alone 5 people walked in late. It was interesting to observe those who snuck in quietly, rolled out their mat gently and joined the class like they were there all along versus those who stumbled in, dropped their armload of stuff with a thud, slapped their mat onto the ground and managed to disrupt everything and everyone around them in the process. I understand life gets in the way and you may be running a few minutes late – hey, we’re glad you made it! – but please be considerate and enter the room quietly! Contain your mess to your mat! Most yoga studios or gyms will have some sort of locker of cubbies you can leave some of your stuff in – use them! You don’t need to park your large purse and winter jacket on the floor next to your mat. Try to limit the items around you to yoga related props (blocks, blanket, etc.) and a water bottle if you need one. When the teachers asks if you have any injuries tell them! I promise you we’re not being nosey! We learn a lot about anatomy in our training and we’re knowledgeable as to what poses you should avoid if you are dealing with an injury – the last thing we want is for you to get (more) hurt in our class! A good yoga teacher will tell you if there is a pose you should skip, if there is a way to modify it so it will put less stress on a certain body part, or if there is an alternate pose you can do instead! And here’s a secret…if you’re just not feeling a certain pose one day – don’t do it! Really! Feel free to make your practice your own and skip a pose that may not be working for you for whatever reason. Yoga props and adjustments from a teacher aren’t because you can’t do a pose and need “help”. Props and adjustments are to help you get the most out of the pose. Please don’t feel like you’re doing something “wrong” or are “not good enough” if you need a prop or a teacher comes over and gives you an adjustment – in fact I bet most teachers would tell you they LOVE getting adjusted during a class, it usually helps you access the pose a little deeper than you could on your own! If you go to a yoga class and absolutely hate it, please don’t give up! There are many different styles of yoga and many different yoga teachers and you may just not have found the right fit – I can’t tell you the difference a good yoga teacher makes! Do you practice at home or at a studio/gym? I’d love to know if you have any other yoga questions I can answer! I’m so glad to hear you had such a good experience at your first class! I hope you continue to enjoy it! I practice yoga at home. I found trying to keep with the times at the gym interfered with my weight lifting, and that’s the part I need to focus on. Using DVDs at home lets me get yoga into my schedule at the times I need it. It’s definitely hard when the classes offered don’t fit into your schedule, that’s great that you’re able to get in some yoga at home though! Do you have a favorite DVD you use?? I don’t know if I have a favorite, but I like a flowing style. I have one that is a stretching routine and I don’t like it as much as one where I can move around and loosen up my muscles. Great tips! I go to class once a week. It’s so important for runners I think! Yes! Yoga has made such a difference in my running and recovery! I have an on again-off again relationship with yoga. I used to go to a studio once a week, but life kept getting in the way. Now I’m more apt to unroll my mat and do it at home, or throw in 20 minutes after a run. Every now and then I head to a class, especially on vacation when I have the time! I get much more out of it in class than at home, but I do what I gotta do! I love yoga on vacation! It’s even more relaxing than usual! Yes! I’m almost done with a Yoga series on my blog, and I 100% agree with what you said, perfect! Thanks! I’m going to head over and check out your yoga series! I absoultely love yoga and used to go all the time but when my focus shifted to running, I didn’t go as much. I need to get back on the mat as I know it makes a huge difference in my running! Same thing happened to me when I started running, but when I managed to start doing both both regularly I realized I how well yoga complimented my running! Right?!? It’s amazing how many people lack common sense! I’m always floored at how noisy people are coming into a yoga class late and I just want to look up and be like – really?!? I used to be a 2 to 3 times a week yogi but then life got in the way and I’m lucky if I make it once a week. I really miss it. My body does much better when I’m going to yoga regularly. These are great tips – Listen to your body is a good one. It took me awhile to realize people weren’t going to judge me if I skipped a pose. Coming in close to that is tell the instructor if you have injuries – when I first hurt my knee I had some great teachers who told me how to modify certain postures. To this day, if my knee is bothering me, I’ll use those modifications. I think learning to listen to your body can be very hard for some people, especially those that are really competitive! I try to make it a point to mention several times throughout my classes to do what works for you and what your body needs – it’s so important to make the practice work for you, otherwise what’s the point?!? I feel the same way about Taekwondo — it has a lot to do with that mind-body connection, I think! Running can make me feel frustrated sometimes because there’s pressure to PR or run a certain speed or log training runs when I’m not up to it, but when you have another activity to fall back on that forces you to just focus on your body and breathing and movement, etc., it makes a big difference. I was attending yoga classes fairly regularly when I first started losing weight, and I definitely enjoyed it, but I had a REALLY hard time quieting my mind. I’m totally Type A, and I’ve always been a tad high-strung…I always have to be busy and thinking and worrying about something or other, and I could not for the life of me just relax and focus enough to really reap all of the benefits.